Cozy Bums is a mom owned Cloth Diaper (And Accessory) business that has their own wee little product tester who has approved every product sold in the store. Of course one of the main products that Cozy Bums carries is cloth diapers, in many sizes, colours, types and styles. They sell a variety of brands, featuring the ever-popular FuzziBunz Pocket Diapers, bumGenius! 4.0 Cloth Diapers, AMP One-Size Duo pockets, AppleCheeks, Happy Heinys, GroVia Hybrid Diapers, Kissaluvs, Flip, Bamboozle Organic Fitted Diapers, Bummis Prefolds and Covers, Stretch Bamboozle, Baby Kangas One-Size Pouch Diapers, Tots Bots Easy Fit and Tini Fit, Charlie Banana cloth diapers and much more. My experience with Cozy Bums started when I was pregnant with our second child. Having cloth diapered with our first child I knew I would be with this one too. However, I also had set aside some money so that I could make an investment in some more decent diapers. We finally settled on the Fuzzi Bunz Diapers, and having used Velcro diapers with our son we were excited for the snaps and the pocket diaper concept. We had a great time picking out colours for our "stash". We are currently still using Fuzzi Bunz in size mediums and working toward potty training. I really like this color of Fuzzi Bunz in Crushed Berries. The next item we got this time around that was different than our first was the hanging diaper pails. Space is at a premium in our townhouse and we wanted something that would minimize odors and hanging on a door meant it would not take up floorspace. There of course is a faint odor when putting in a diaper as you open the bag but otherwise this product is amazing. We got two so we could always have one to use while washing. 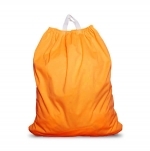 The beauty of this bag is once the diapers are rinsed and in the bag you don't handle the diapers. Dump the bag and shake the diapers into the washer and you are set. We also love the Diaper Sprayer that we received from Cozy Bums. The bum Genius cloth diaper sprayer quickly became a favorite in our house. Clean up has been so much easier with this item and install was nice and easy. As long as we remember to not turn up the spray too high clean up of diapers is a quick, not get your hands yucky process. CozyBums has a wide variety of other products such as swim diapers, cloth wipes, wet bags, cloth diaper friendly laundry detergent, changing pads, fasteners, creams, training pants, diaper bags, baby clothes and gear, and baby and skincare. So there is something for everyone, even for those who are not cloth diapering or kids have outgrown diapers. Cozy Bums also includes valuable diaper care information on their website and for those who love a sale (who doesn't), they regularly have those too! Head on over and check out the website to browse or place an order. 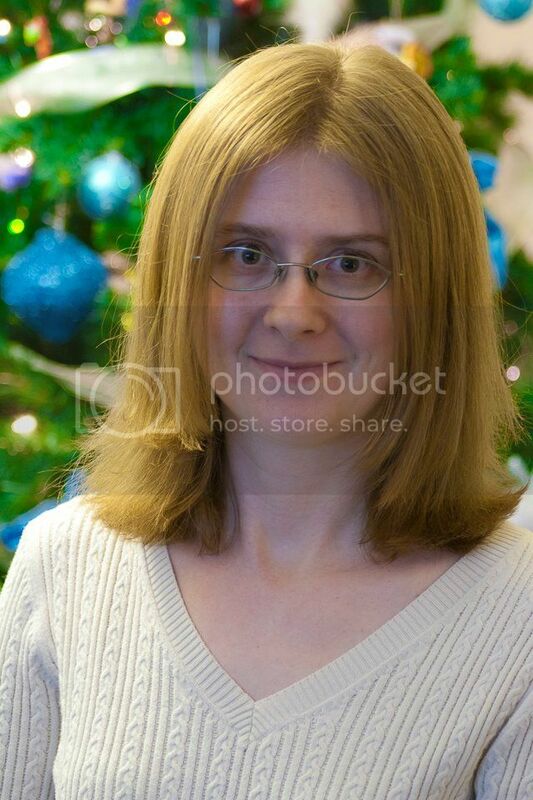 You can also interact with Cozy Bums on Facebook. If you have any questions contact info is readily available on the website or Facebook and owner Kerri would be delighted to answer any questions you have! 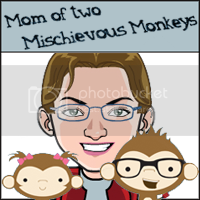 Cozy Bums has offered to give one CANADIAN Mom of Two Mischievous Monkey's reader with $50 to spend on anything they sell. 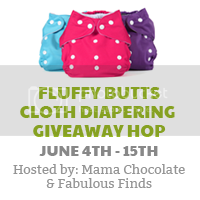 So be sure to come back between June 4th and June 15th to enter to win as part of the Fluffy Butts Cloth Diapering Giveaway. You will also be able to hop around and enter for other prizes from other participating Blogs. Disclaimer: All opinions expressed in this post are 100% mine and I was not monetarily compensated to write this post. I'm looking forward to this event starting. Your giveaway looks like it's going to be a good one. My kids are both out of diapers now but I had considered cloth diapers for my youngest when I was pregnant, but chickened out. I'm so weak. It's a great idea and wished I had done it. Diapers are sooo expensive and the store never had the size I wanted. This is a great giveaway and I hope it gives some soon to be new parents some food for thought about the possibility of using cloth diapers. So much better for the environment too. I didnt use cloth diapers with my first child but i plan to learn more about them and use them for my next child. I think they are a great idea and these are way cute! Oh I can't wait for the giveaway! How cool!! Thanks! I'm longing for a diaper sprayer! I need to just bite the bullet and BUY one. I love that they are a Canadian store. I would love to try a FuzziBunz diaper. Wish it was free shipping on any order though.